Bold Type Books, 9781568585345, 320pp. Americans, for all our talk of pulling ourselves up by our bootstraps, obsessively seek advice on matters large and small. Perhaps precisely because we believe in bettering ourselves and our circumstances in life, we ask for guidance constantly. And this has been true since our nation's earliest days: from the colonial era on, there have always been people eager to step up and offer advice, some of it lousy, some of it thoughtful, but all of it read and debated by generations of Americans. 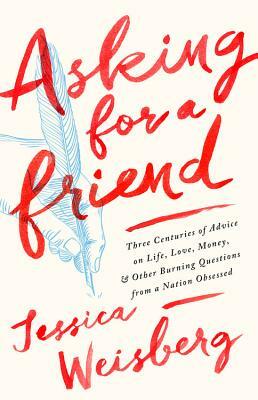 Jessica Weisberg takes readers on a tour of the advice-givers who have made their names, and sometimes their fortunes, by telling Americans what to do. You probably don't want to follow all the advice they proffered. Eating graham crackers will not make you a better person, and wearing blue to work won't guarantee a promotion. But for all that has changed in American life, it's a comfort to know that our hang-ups, fears, and hopes have not. We've always loved seeking advice--so long as it's anonymous, and as long as it's clear that we're not asking for ourselves; we're just asking for a friend. Jessica Weisberg is an award-winning writer and producer. Her writing has appeared in the New Yorker, New York Times, Harper's, and Atavist, among other publications, and been nominated for a National Magazine Award. She was a producer on the podcast Serial and runs the features unit at Vice News Tonight on HBO, for which she's been nominated for an Emmy. She lives in Brooklyn.